There is a bit more time per question. There is no longer a penalty for guessing incorrectly (this was a main driver of students selecting the old ACT over the old SAT). Now there are four answer choices instead of five. 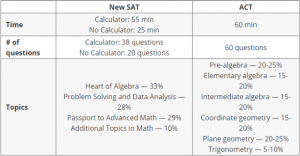 Scoring for the test is 1600 (800 for combined Reading and Writing) and 800 for Math. 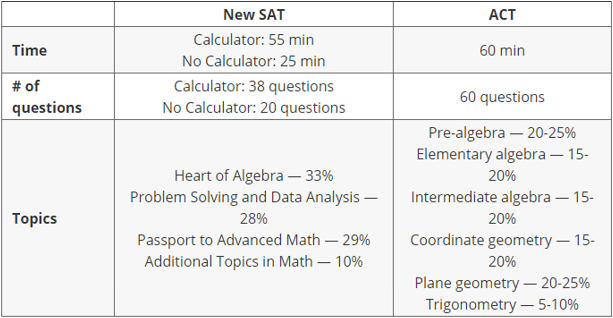 The new math is harder so the curve has been adjusted to be “more forgiving.” For example, the old test gives a 700 with 4 incorrect answers; new test gives 700 with 8 incorrect answers. There are more science graphs in the math section requiring interpretation and reasoning (but not science achievement). Math problems are more rigorous, more analytical, and require more critical thinking. Algebra is more prominent and geometry is less prominent. Very little trigonometry remains. More statistics has been added. More “expected value” questions rather than simple average calculations. There are now more multi-part questions.